A woman, searchingA killer, planning...A thrilling new FBI series for fans of Tess Gerritsen and Karin Slaughter. FBI Agent Elsa Myers finds missing people.She knows how it feels to be lost...Though her father lies dying in a hospital north of New York City, Elsa cannot refuse a call for help. A teenage girl has gone missing from Forest Hills, Queens, and during the critical first hours of the case, a series of false leads hides the fact that she did not go willingly.With each passing hour, as the hunt for Ruby deepens into a search for a man who may have been killing for years, the case starts to get underneath Elsa's skin. Everything she has buried - her fraught relationship with her sister and niece, her self-destructive past, her mother's death - threatens to resurface, with devastating consequences.In order to save the missing girl, she may have to lose herself...and return to the darkness she's been hiding from for years. 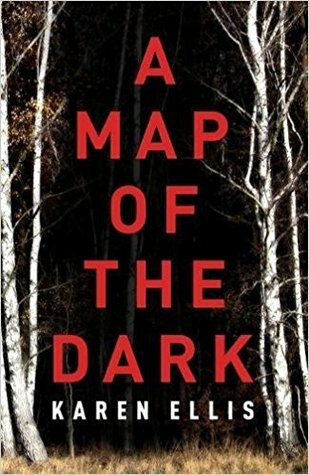 A Map of the Dark is everything I love about thrillers! Though this book is about the heart-racing attempt to find a missing girl, there is a haunting sub-plot/backstory that was unexpected and heartbreaking. If you were a fan of the AMC/Netflix series The Killing than I am almost certain that you will love this novel. I found many traits in Elsa that reminded me of Agent Linden from The Killing. Elsa is passionate and lives and breathes her cases. Even though she is fighting her own demons and caring for her dying father, she cannot resist the urge to help when a teenage girl vanishes into thin air. I loved Elsa's character, her will to solve the case vibrates off of the pages. She has strength but there are many moments of vulnerability. The author did a wonderful job at crafting Elsa. Though she seems she may have it all together, the dark shadow that looms over her quickly makes its appearance. The author, Karen Ellis, did a superb job at the pacing of this story. She doesn't just dish it all out a once, it is delivered slowly and delicately, but it also doesn't drone on with unnecessary dialogue and filler. Every detail and moment plays an intricate part of the entire story. I enjoyed every single minute of A Map of the Dark. It's a fast-paced, nail-biting reading experience that will have you hooked from page one. "And then, suddenly, she isn't ignoring you--she's gone"
The Killing is such a fantastic show! The fact that you say fans of that will love this book makes me want to read it even more!! Great review! Adding this one to my TBR list. It is an epic show! I found a lot of similarities between Det. Lindon from The Killing and Elsa. Both are very strong and passionate detectives but they are both fighting some pretty dark demons. If you read it, let me know what you thought!